One of the largest independant builders merchants in the UK, Huws Gray has over 40 branches across North Wales and the North West. Operating from their HQ in Anglesey, they aim to be a one-stop-shop for all of their customers’ needs. With a high prestige and large customer base it is important that all of their facilities meet the demands of their clientele. 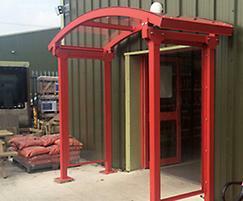 Huws Gray contacted AUTOPA regarding the entranceways to their branches. Their current entrance facilities were inconsistent, some with shallow canopies, whilst others had no cover at all. They were looking to standardise their entranceways across all branches, to provide a more cohesive company image. Adding further covered areas outside meant customers would receive more protection from the elements, and have an improved retail experience. 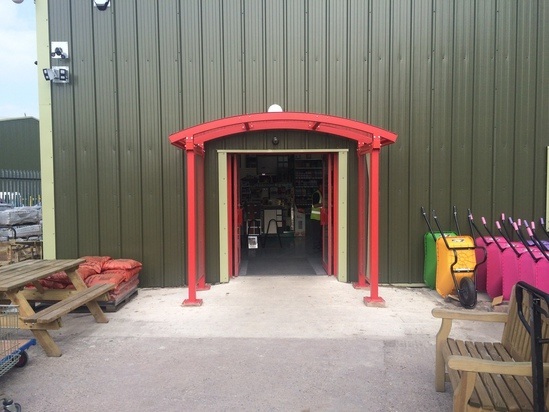 Their Winsford branch was identified as being in particular need for improvement, and so AUTOPA was tasked with replacing the existing canopy to enhance the branch’s external appearance. Inspection of the current entranceway revealed an open canopy, which provided little cover for customers. Although it had limited depth, the width of the canopy was having an impact on other on-site facilities; it was so wide the canopy was encroaching onto the car park, and taking up valuable parking spaces. AUTOPA was asked to replace the current canopy with a canopy from the AUTOPA open spaces range, providing greater cover, whilst taking up less space. As well as improving on the functionality of the existing canopy AUTOPA needed to construct a product that would make the building’s entrance instantly recognisable, and match the aesthetics of the wider store. Huws Gray branches are frequently located within warehouses, or similar types of building. Rapid identification of main entrances is not always easy on these buildings, so broadcasting its location to the public using appropriate entranceways is crucial. AUTOPA supplied Huws Gray with a bespoke lean-to canopy, a modified version of the AUTOPA open spaces Door Canopy, and a perfect fit for the double doors it led to. Smaller than the predecessor, at only 3 metres wide, this new canopy fitted comfortably over the customer entrance, freeing up the parking spaces the previous canopy had occupied. Increasing wall projection to one metre, and adding side panels to the canopy enclosed it, providing the protection from the elements that the previous canopy did not. 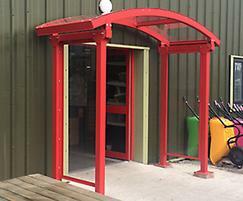 It was important to Huws Gray that any products AUTOPA introduced fitted with the existing colours on site. 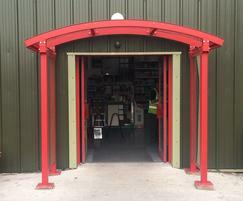 All AUTOPA products are supplied galvanised as standard, increasing their longevity. 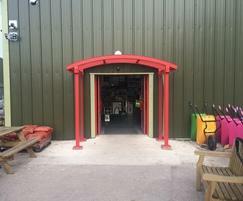 Galvanised products are also available colour coated in a multitude of RAL/BS colours, and so colouring the canopy to match existing branding was no issue. 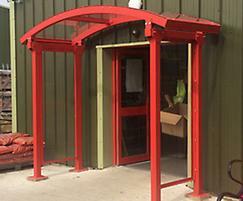 This site was used as a trial for AUTOPA working in partnership with Huws Gray. As such the canopy was designed to be easily repeated across different sites, whilst maintaining the flexibility to adapt for the changing needs of different sites. The new canopy has proven to be a success, and the design is scheduled to be installed at a further 16 Huws Gray sites in the near future. Interested in this case study? The sun has been showing its face this week, and people are enjoying their open spaces for the first time in a few months. However, with the addition of a simple canopy, these open spaces could be used all year around.